The cluster of national parks and reserves set in the semi-arid lowlands running broadly northeast from Mount Kenya includes some of the country’s most rewarding safari destinations. In part, this is because they protect a very different fauna to their more southerly counterparts: not only an intriguing selection of localised dry-country large mammals including reticulated giraffe, Grevy’s zebra and gerenuk, but also a long list of birds whose range is more-or-less confined to the north of Kenya and far south of Ethiopia. The region’s best-known attraction is the near-contiguous trio of Samburu, Buffalo Springs and Shaba National Reserves, which protect a combined area of 440km2 flanking the perennial Ewaso Nyiro River as it flows through an otherwise austere landscape of scrubby rocky plains and bare termite mounds. Less popular is the 870km2 Meru National Park, whose cover of tropical grassland and savanna is bisected by a series of narrow perennial streams that rise in the central highlands and empty into the Tana River - Kenya’s longest waterway - as it runs along the park’s southern boundary. Named after the red-robed pastoralist people who inhabit the surrounding plains, Samburu National Reserve, set on the north bank of the Ewaso Nyiro, protects a relatively hilly tract of dry thornbush that rises to 1,250m at Ol Doinyo Koitogorr. 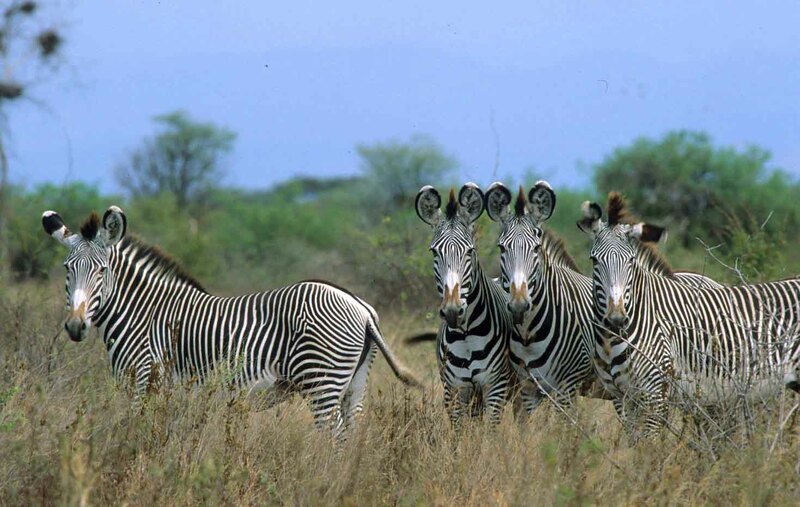 Characteristic wildlife of the open plains includes the endangered Grevy’s zebra, which is far bulkier and more narrowly striped than the familiar common zebra, and the handsome reticulated giraffe, distinguished by its geometrically-marked coat. Dry-country antelope include Beisa oryx, lesser kudu, Guenther’s dik-dik and the bizarre stretch-necked gerenuk, which habitually stands erect on its hind legs to reach the leaves that most other browsers can’t. Buffalo Springs National Reserve, set on the south bank of the Ewaso Nyiro, supports a similar range of wildlife to facing Samburu. It is one of the more reliable places in Kenya for leopard sightings, and the springs for which it is named - a perennial marsh fed by underground water - attract plenty of wildlife in the dry season. Situated on the south bank of the Ewaso Nyiro only 5 km east of Buffalo Springs, little-visited Shaba National Reserve is if anything even drier and more sparsely vegetated than its neighbours, but the range of wildlife is similar. The main game-viewing loop runs through a mosaic of lava-strewn plains, parched grassland and acacia woodland, offering glimpses to the river and passing by several hot springs. In the far east, a spring-fed waterhole once used as a campsite by Joy Adamson now attracts a steady trickle of elephant, buffalo, lion, reticulated giraffe, Grevy’s zebra and antelope. A long list of avian specials whose range is largely restricted to northern Kenya and bordering parts of Somalia and/or Ethiopia makes Samburu-Buffalo Springs-Shaba a key site for birdwatching. 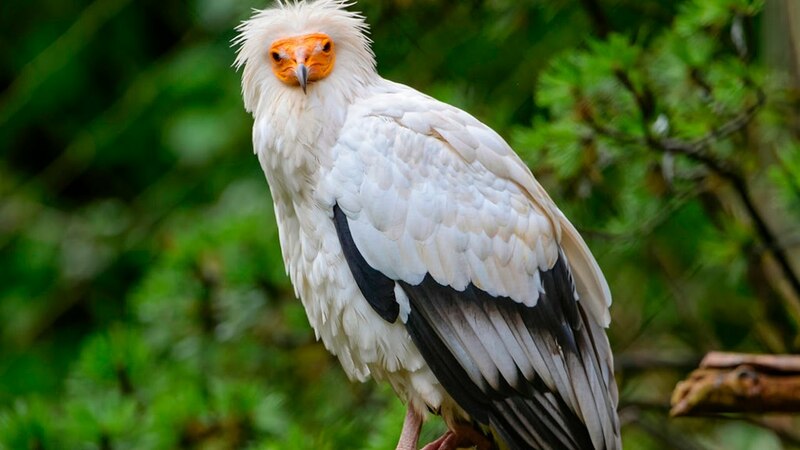 Literal heavyweights on this list of specials include are Somali ostrich, Abyssinian ground hornbill and the spectacular vulturine guinea fowl, and it is the most reliable site in East Africa for Egyptian vulture. Other specials include white-headed mousebird, Somali bee-eater, golden pipit, rufous chatterer, bare-eyed thrush, bristle-crowned starling and black-capped social weaver. Running north from Samburu-Buffalo Springs, the 3,940km2 Namunyak Wildlife Conservancy protects an area of arid northern plains surrounding the Mathews Range, whose forested slopes host plenty of wildlife and several rare plant species. The main attraction here is multi-day camelback and walking safaris. More lush and moist in feel than Samburu-Buffalo Springs-Shaba, Meru National Park possesses a genuine wilderness atmosphere that make it a favourite with repeat safarigoers. All the Big Five are here. You can be pretty certain of seeing elephant, buffalo and rhino (the latter restricted to a large fenced area that runs south from the main entrance gate), but big cats are generally quite difficult to spot on the tall grassland. The reticulated giraffe is very common, but other dry-country ungulates such as lesser kudu, Grevy’s zebra, Beisa oryx and gerenuk are relatively scarce. The boundary between Meru National Park and the remote Mwingi National Reserve by is a lushly-forested stretch of the Tana River. Here, the rapids known as Adamson’s Falls (after George Adamson), are the most accessible point anywhere along the course of what is Kenya’s largest waterway. Meru National Park’s Ura River is the site of Elsa’s Grave, the burial place of the lioness subject of the film Born Free. 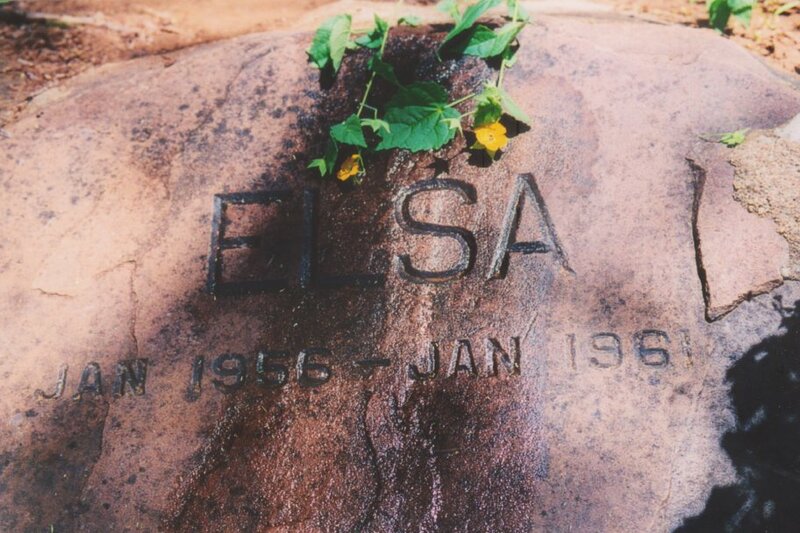 Hand-reared as a pet by Joy and George Adamson, Elsa was released in to Meru National Park in 1958 and successfully reared three cubs there before dying of a tick-borne fever at the age of five. All the reserves and parks described above are best visited on an organised safari, though self-drive is also a possibility. They can be reached in a long half-day drive from Nairobi via the frontier town of Isiolo, or appended onto a safari also taking in the likes of Masai Mara, Lake Nakuru and the tree hotels of Aberdares and Mount Kenya. The closest airport for scheduled flights is Nanyuki, but charter flights directly to the reserves are available. Samburu-Buffalo Springs is serviced by a good range of lodges, tented camps and campsites. There are also lodges and camps in Shaba and Meru, but fewer, which only adds to these reserves’ aura of exclusivity.